Learn how to build a house in Minecraft quickly and efficiently, whether the home you construct is as simple as a shack or more complicated, like a larger house with multiple rooms. The step–by–step instruction covers choosing the right location and building materials, assembling the framework of your house, and adding doors and decorative features to complete your house-building — fast and proficiently. The video above covers construction of a one-room rectangular house while also goes into an example of building a two-room, multi-level in-game home. Both quick and easy Minecraft construction projects include tips on how to avoid falling off your structure during the building process, how to quickly build sections of your house, and more. With the basics in mind, you can progress to more complicated homebuilding, with variations in materials and locations. 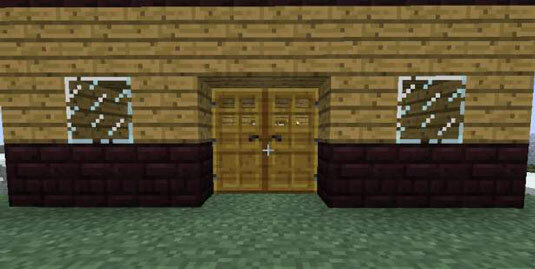 You can build virtually anything in Minecraft, so why not use that ability to create impressive houses? Check out the following steps you need to take to build exciting and creative structures. The first step to building a house is figuring out exactly what it is that you want to create. First, focus on the purpose of the building or home. How do you want to use it? Is it only for decoration, or does it have a function? If your building has a specific function, think more about what you need to build or place inside and out. Where you decide to build contributes to your building’s look. For example, are the surrounding buildings square, or are they rounded? If all other structures are square, yours should be square, too. Also, what does the environment look like? If you are in a desert biome, building a modern cobblestone house may stand like a sore thumb! Choosing blocks is simple: Just refer to your original plans and pick the type of block that matches the idea. For example, if you want your building to look ancient or abandoned, use cracked blocks that look like cracked stone bricks. If you created the house with a specific theme, pick the color of the blocks based on that theme. Blocks are typically used for roofing, floors, walls, and other elements of a house (such as fireplaces, pillars, etc.) so be sure to select the right design choice. As always, the new structure should blend in with its surroundings. As always, the new structure should blend in with its surroundings. To set up the area, you first need to find an area. Where do you want your Minecraft house? On the beach? In the woods? In a city? The central room of your house is the first room you enter, and you build all other rooms around it. First plan out the central room. Though this step may seem boring, don’t skip it! Remember the ceiling and the floor! To make these items, fill in the top and bottom of the wireframe. 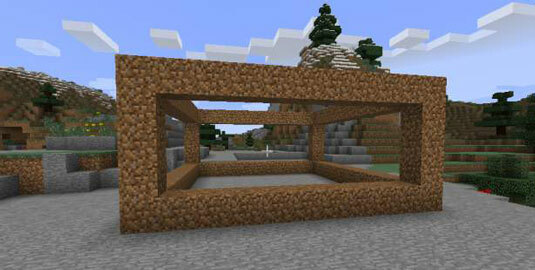 Soon you will have an enclosed Minecraft house! 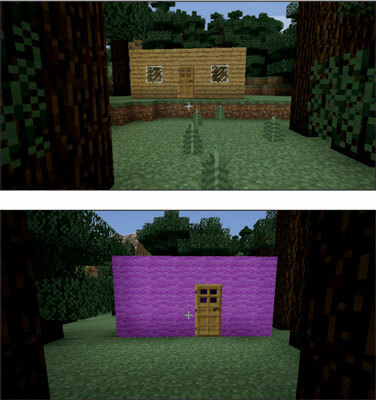 Now it’s time to pay attention to the details of your house in Minecraft. Elements such as trim, decorated doorways, and 3D designs can add pizazz to your build. Trim makes the colors in your house stand out and helps your house look more three-dimensional. Trim is all about the color of the blocks. Pick trim colors that complement each other. Go outside and look at your house to see how other players will view it. If you see something you want to change, whether it’s a major revision or a small tweak, go ahead and change it. 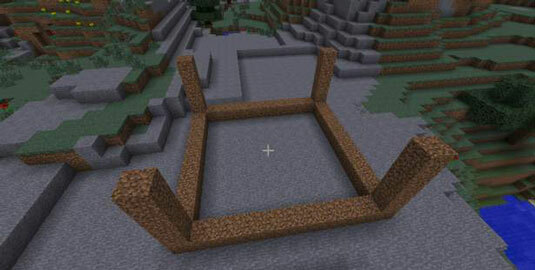 Be creative when building your house and other structures in Minecraft. Although a wooden rectangle with a door is likely to satisfy most of your needs, having a giant house full of storage chests, crafting tables, beds, farms, and other tidbits is always satisfying — and a welcome sight after completing a long adventure. The type of house reflects the personality and skill of the builder and can even be a status symbol in multiplayer games. To build upward, jump and quickly place a block underneath yourself. Repeat this action to make a pillar. To build off a ledge, hold the Shift key (so that you don’t fall) and walk up to the rim of the ledge. 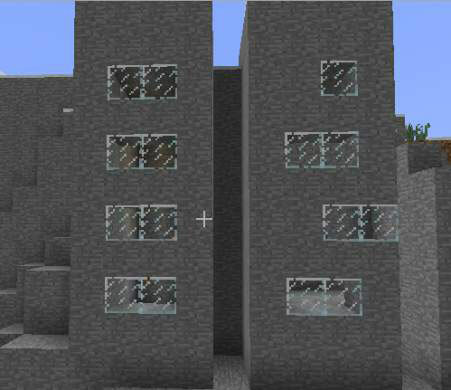 Then you can place blocks on the side of the ledge as shown in the figure. 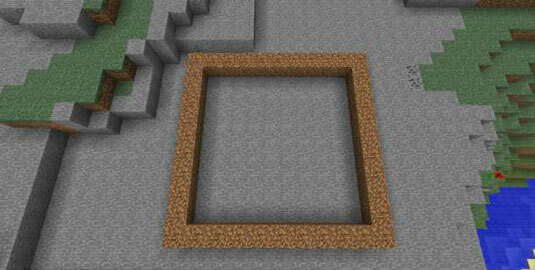 To build a floor, move backward while placing blocks in front of you to make a line. To fill a space, repeat in any pattern you choose.